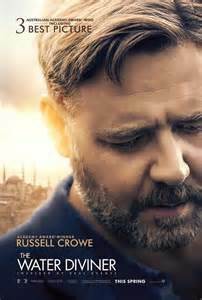 Russell Crowe’s directorial debut, “The Water Diviner”, shows that he has learned enough about films after being in them for 25 years not to embarrass himself plus he shows a good hand at directing actors including himself. He, also, as a first time director, makes the usual mistakes. “The Water Diviner” is, basically, an anti war and father-son saga, telling the story of a father who goes looking for the bodies of his 3 soldier sons lost in the battle of Gallipoli during World War 1 to bring their bodies home and bury them next to his wife (Jacqueline McKenzie) who commits suicide over their death. The story is based, very loosely, on the true event of Joshua Connor (Crowe) being the only father who came looking for the bodies of his sons of the millions lost there. In flashbacks and/or imaginary scenes we meet his sons Arthur (Jack Patterson as a young boy, Ryan Corr as a soldier), Henry (Ben Norris/Ben O’Toole) and Edward (Adian Smith/James Frasier). Along the way we meet Orhan, a preteen played charmingly by Dylan Georgiades, and his mother played by Olga Kurylenko, leading to a completely unnecessary romance between her and Connor, though she is used to show some of the ways women are treated and are expected to live in Turkey at that time. Steve Bastoni, as her brother-in-law, is a stereotype of Turkish males. Along with the romance, director Crowe and writers Andrew Knight and Andrew Anastasios, bring in some very cryptic and mysticism regarding Connor’s ability as a water diviner in his attempt to find the bodies of his sons. There is also the introduction of the father reading “The Arabian Night” to his young sons that really doesn’t pay off. Along the way we meet military men such as a British officer, Dan Wyllie, who tells the father to return home , Jai Courtney who attempts to help him, and Turkish war veterans Yilmaz Erdogan and Cem Yilmaz are standouts, especially the former, supporting Connor. Aside from some fake, extraneous war scenes and one very ‘Hollywood’ love scene director Crowe does a good job while he reigns in actor Crowe’s tendency to be a ’star’. Next time Russell Crowe directs a film he should pay more attention to the story line and what is believable and what isn’t. Oh yes, though the production is fine that bombastic score is jarring.